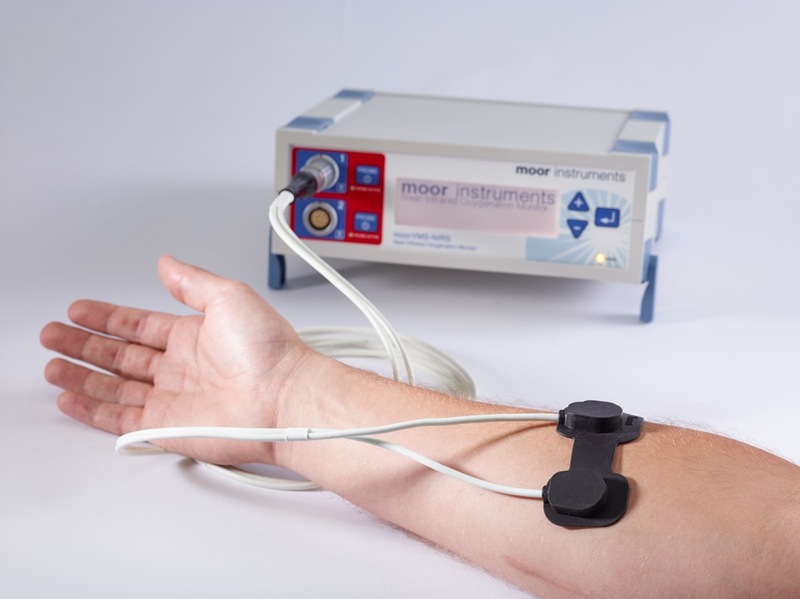 We are pleased to announce the imminent release of a brand new moorVMS measurement module, the moorVMS-NIRS (near infrared spectroscopy) system for deep tissue oxygen measurements. The system will be launched at three events upcoming, The World Congress of Microcirculation in Kyoto, German Microcirculation Society in Hannover and Society for Neuroscience in Chicago. The system strengthens our position in the field of tissue oxygen sensing and follows the same design ethos as the other moorVMS modules, high quality, ease of use and complete integration within the moorVMS-PC software package. It is intended to probe much further beneath the skin (in comparison to the moorVMS-OXY system), down to the muscle level for sports science applications and through the skull to allow study of real time changes in cerebral oxygenation. We have also included access ports for our laser Doppler and tissue Oxygen probes within the probe holder to allow simultaneous measurements of your preferred combination of physiological parameters. The first systems will ship towards the end of the year. If you would like to see the monitor for yourself, we will be booking demonstrations / trials shortly – just drop us a message.